The best time to visit Barcelona is in the spring. You've got beautiful weather (think temperatures in the high 60s and 70s Fahrenheit), a handful of fascinating cultural events, and — as the tail end of low season — fewer tourist crowds. That being said, summertime brings prime beach weather, and the city also holds a special allure during the winter holidays. 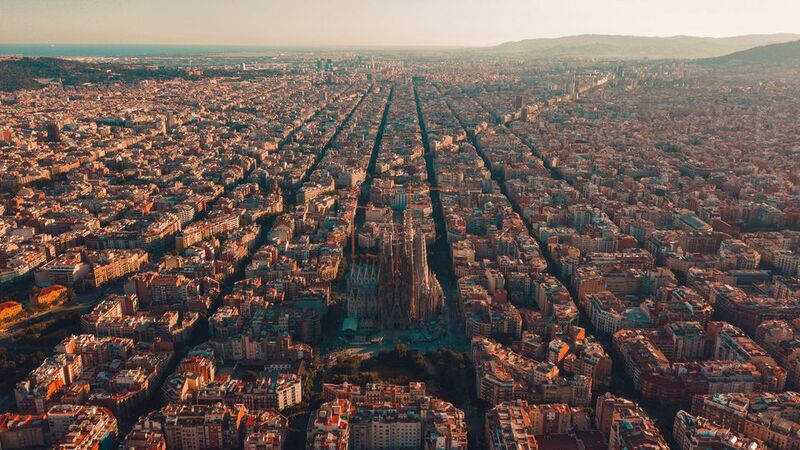 Visitors to Barcelona in the low season will enjoy shorter lines at attractions, and locals won't have to deal with nearly as many crowds as they go about their day-to-day lives. The weather in Barcelona throughout much of the year tends to be on the pleasant side. Even in winter, temperatures tend to hover in the relatively mild range of 40 to 60 degrees Fahrenheit, making the Catalan capital a much warmer destination than most other major European cities at the same time of year. Spring and fall are as lovely as it gets, with plenty of sunshine and warm temperatures lasting throughout the majority of both seasons. Summers are hot and humid, with temperatures staying in the low 80s throughout much of the day (even at night). However, that just gives you an excuse to visit one of the many fabulous beaches in Barcelona. Both tourist crowds and prices on accommodation and travel are at their highest during peak season from late May until early September. If you're dead-set on traveling during this time to make the most of the splendid weather and fabulous beaches, book everything as early as possible to avoid sudden price hikes as the season approaches. Summer also sees much more crowding in Barcelona's more touristy areas due to the high number of travelers, particularly those coming from cruise ships. Be prepared to wait in long lines, and consider booking your spot at popular attractions (such as the Sagrada Familia) in advance. Low season (fall through early spring), on the other hand, tends to be much more pleasant for everyone involved. Tourists can enjoy lower accommodation prices and shorter lines at attractions, and locals don't have to deal with nearly as many people crowding into their city. It's win-win. January is typically Barcelona's coldest month, but keep in mind that "cold" here means an average of 55 degrees Fahrenheit. Tourist crowds are at their thinnest, which means shorter lines at attractions such as the Sagrada Familia and Parc Güell, and accommodation prices tend to be quite low as well. It's also a great month for shopping as the semi-annual rebajas (sales) kick off throughout Spain. Brave the chilly waters of Sant Sebastià Beach at the First Swim of the Year on January 1. The St. Anthony Festival and Tres Tombs Parade (mid-January) are unique neighborhood celebrations where the heart and soul of the true Barcelona shine through. February weather in Barcelona can be quite fickle, with seemingly one pleasant, sunny day for each chilly, rainy one. That being said, it's still low season, and the rebajas are still going strong, so it's a very budget-friendly month on the whole. For the foodies out there, February is peak calçot season, which means many restaurants throughout Barcelona will be offering these tasty Catalan veggies for a limited time. The Llum Light Festival illuminates the Catalan capital every year in mid-February. The feast day of Santa Eulalia, one of Barcelona's patrons, in mid-February brings massive street parties in the area surrounding Plaza Sant Jaume. Without a doubt, March is one of the best times to visit Barcelona. As winter melts into spring, the pleasant temperatures and low rainfall still haven't caught the attention of most tourists, so accommodation prices are still generally low. The Sant Medir Festival in early March is a traditional celebration in the charming Gracia neighborhood. The Sant Josep Oriol Festival in mid-March is another authentic Catalan celebration, complete with the region's emblematic giants and fatheads. As spring officially begins, low season draws to a close. April is generally the last month until fall that sees relatively low crowds and prices. Weather is exceedingly pleasant for the most part, but brief rain showers are not uncommon. Celebrate love and literature at the Sant Jordi Festival, Catalonia's answer to Valentine's Day, on April 23. Experience a miniature version of Seville's iconic April Fair right here in Barcelona. As the temperatures and daily hours of sunshine increase, so do prices and tourist crowds. May marks the unofficial start of high season in Barcelona, so prepare for higher accommodation costs and longer lines at attractions. However, with temperatures in the mid-to-high 70s Fahrenheit, you may even be able to start enjoying the beach — especially near the end of the month. To commemorate International Museum Day on May 18, more than 50 emblematic Barcelona museums and cultural centers have free admission in the evening. Primavera Sound, Barcelona's iconic music festival, usually takes place in late May. In the week leading up to the event, several related live performances also take place throughout the city. It's officially beach season, and though June is one of the busiest times of year in Barcelona, it's also one of the warmest. Bring plenty of sunscreen to prepare for the scorching daytime temperatures and relentless rays. The Feast of St. John on June 23 is a fiery celebration that closely coincides with the summer solstice. Celebrate diversity and individuality at Barcelona Pride in late June. In July, tourist season reaches its peak, and the city center and beaches often experience overcrowding. Temperatures are officially recorded in the high 80s Fahrenheit most days, but can feel much warmer due to the humidity. The Barcelona Beach Festival is a one-night-only music event in mid-July, featuring some of music's biggest stars. Watch hundreds of hot air balloons take to the sky at the European Balloon Festival, also in mid-July. The weather in Barcelona in August is much the same as it is in July, meaning that beaches can get quite crowded. Additionally, this is one of the most expensive times of year to visit the city as far as accommodation prices. The good news: the second round of rebajas sales officially kicks off this month. However, many small local businesses will close up shop for a few weeks as their owners head off on vacation. Barcelona's most charming neighborhood, Gracia, celebrates the Festa Major in mid-August. Another local neighborhood event is the Sants Festival in the neighborhood of the same name in the third week of the month. Things start to calm down a bit in September, both weather-wise (no more brutal heat) and in terms of tourism. Early in the month, temperatures will still be nice enough to enjoy the beaches, which won't be as crowded as the preceding months. Catalonia's National Day is celebrated on September 11. Expect peaceful but large marches and demonstrations. La Mercè in mid-late September is characterized by fun, colorful parades and events throughout the city. Barcelona settles back into low season as fall begins. October weather is still on the idyllic side, with high temperatures remaining comfortably in the low 70s throughout much of the month. The Festa del Roser celebrates the patron saint of La Rambla early in the month. Celebrate Catalan architecture with free admission to many of the city's most famous monuments at 48H Open House in late October. Although the weather is starting to turn chilly, November is one of the most pleasant times of year to visit Barcelona. Low season is in full swing, which means fewer crowds and lower accommodation prices. Music lovers can catch the Voll-Damm Barcelona Jazz Festival taking place throughout the month. The Alternative Independent Film Festival late in the month is a must for cinephiles. Barcelona takes on a positively magical air during the winter holidays. December is on the chillier side with temperatures in the 50s, but the festive spirit in the air and generally low prices make it an ideal time to visit. Christmas markets spring up throughout the city, with the most famous being the Fira de Santa Llucia. Barcelona is one of Europe's biggest New Year's Eve hotspots. Ring in the new year at Plaça Catalunya among thousands of other locals and visitors alike.